Eidi Sab Kay Liye – 24th November 2017 Eidi Sab Kay Liye is a game show hosted by Fiza Ali which is one of the most watched show of Ary Zindagi. Eidi Sab Kay Liye - 30th March 2018 Eidi Sab Kay Liye is a game show hosted by Fiza Ali which is one of the most watched show of Ary Zindagi. Eidi Sab Kay Liye - 2nd March 2018 Eidi Sab Kay Liye is a game show hosted by Fiza Ali which is one of the most watched show of Ary Zindagi. Eidi Sab Kay Liye - 24th February 2018 Eidi Sab Kay Liye is a game show hosted by Fiza Ali which is one of the most watched show of Ary Zindagi. 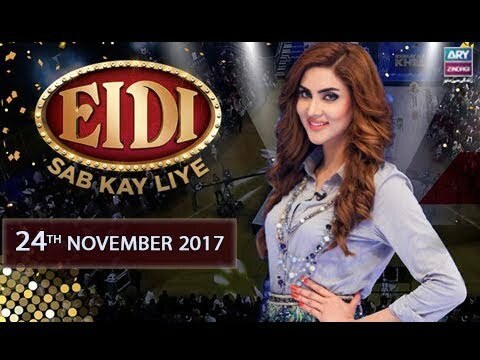 Eidi Sab Kay Liye - 28th October 2017 Eidi Sab Kay Liye is a game show hosted by Fiza Ali which is one of the most watched show of Ary Zindagi.